Come On Guys. The DualShock 3 Sucked. The original PlayStation controller debuted in 1994. The more familiar DualShock was released in 1997. The PlayStation 3 controller you're using today, well into the 21st century, is almost identical to that 1997 design. Let's think about that for a second. It's now 2013, and if you've got a PS3, you're still using a pad whose shape was conceived alongside spring-loaded disc trays and RGB inputs. 2005. E3. When the PS3 was first unveiled over eight years ago, back when it promised to include 117 USB ports, 37 SD card reader slots and an electric cup holder, Sony also showed off a new PlayStation controller. Consisting of a radical boomerang shape, it was a massive departure from the company's iconic pad design, and most fans - and pundits - laughed their asses off. Or recoiled in horror. Or both. Initial reaction was so poor that Sony canned the design before the PS3 was even released, reverting not to an alternative effort, but going back in time, to a controller layout so similar to that of the PlayStation 2's DualShock 2 that it was only a lack of wires that let you tell which was which at a distance. Congratulations, guys. You got what you wanted. And in doing so, condemned us all to seven years of sucky controllers. The DualShock 3 - and Sixaxis before it - are by today's standards terrible pads. I find them to be uncomfortable to hold for long periods of time, not to mention occasionally physically painful (thumb tendons aren't meant to hold sticks like that, which is why the DualShock 4's are higher). Their triggers feel cheap. The thumbstick placement is far from ideal for playing shooters, and those thumbsticks have a deadzone as big as a mass grave. Some would argue that this regression, a return to the good ol' controller, was a good thing. That it established a legacy. That it was Sony sticking with a winner. That argument might have helped fanboys sleep at night, but it also ignored ten years of advances in ergonomics and controller design, from the DreamCast's wonderful analog stick and triggers to the Xbox Controller S' all-around comfort . It also forgets the fact Sony themselves had got rid of the template over eight years ago, and brought it back not as a design decision, but as a reactive marketing call. Most sane people would, if given the choice between playing a game using the DualShock 3 or Xbox 360 Controller, would go for Microsoft's pad every time. Understandably! One controller was designed with the current hardware generation in mind. The other was nearly indistinguishable from a model of the PlayStation controller first released in 1997. But hey. It's not all bad for the PS3's controller. 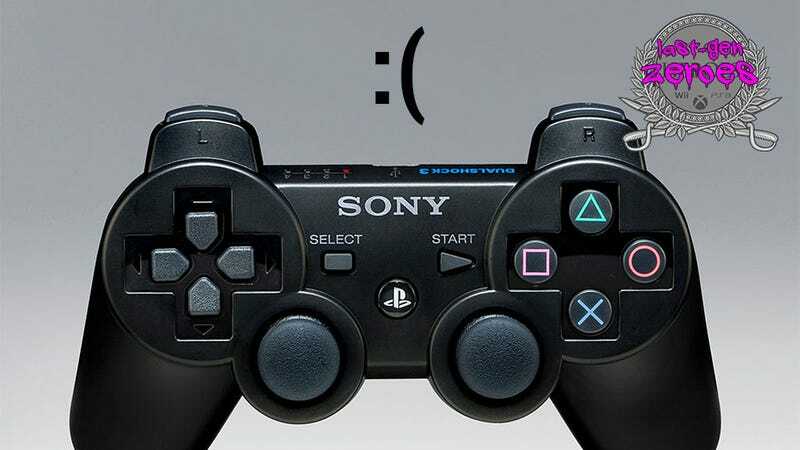 There are two areas the DualShock 3 came out on top against Microsoft's 360 pad. It's just a shame for Sony that neither are anywhere near as important as comfort. The first is the d-pad. OK, so Microsoft would lose this contest to a toilet roll holder, so bad is the 360's effort, but the DualShock 3's d-pad is still a good one, as useful for flicking through the XMB as it has been for games involving stuff like 2D platforming. The second is the battery. Microsoft went cheap, and it cost the 360 pad (and owners), users left to either lug around AA batteries or pay extra for rechargeable packs. Sony's built-in battery, on the other hand, has proven to be a wise investment. ANECDOTE: I've been using the same primary controller for both consoles since 2008. In that time, I've been through four Xbox 360 battery packs for my 360 pad, either as a result of hardware failure or a loss of charge. The PS3's in-built battery, meanwhile, still lasts for hours, which is insane when you consider my PS3 isn't just a games console, it doubles as my media centre. At the end of the day, it's clear the DualShock design is past it. Even Sony knows it. Remember, and I'm going to reiterate this again, it was due for retirement in 2006, and only kept around because Sony flinched in the face of backlash. There's no such stay of execution in the age of the PS4. The new console's controller is a marked departure, abandoning its predecessor's angular handles and coming up with an all-new design for shoulder buttons and triggers. In fact the only thing that's a trademark Sony design at all is the thumbstick placement, and even that nearly didn't make it. If I've made it sound like I hate the DualShock design entirely, I don't! In the late 90s, and even into the PS2 era, it was a fantastic controller layout, and will forever be remembered for pioneering the idea of putting two thumbsticks on a console pad. It's also one of the few controllers you could ever call "iconic", quite an achievement considering that's a plaudit normally reserved for Nintendo products of the 1980s. It's just...sad that an old champion was kept around past his prime. He deserved to bow out alongside the PS2 as masters of the world, not as an outdated piece of tech dragged out of retirement into one last, sorry fight. Last-Gen Heroes is Kotaku's look back at the seventh generation of console gaming. In the weeks leading up to the launch of the PlayStation 4 and the Xbox One, we'll be celebrating the Heroes—and the Zeroes—of the last eight years of console video gaming. More details can be found here; follow along with the series here.